The perception created by the interview was that he favours the people of Sabah sharing their state with claimants linked to a defunct Sultanate in Sulu. KOTA KINABALU: Bingkor Assemblyman Jeffrey Kitingan has confirmed that he will be filing a legal suit against an online portal over implicit statements which he did not make on the Sabah claim during an interview with it. He will also be lodging a police report. 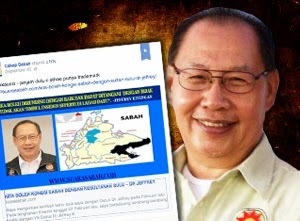 Jeffrey was referring to the perception created by the interview that he favours the people of Sabah sharing their state with claimants linked to a defunct Sultanate in Sulu. He now wants the report retracted. He thinks the article may be an attempt to threaten his supporters that the struggle for self-determination would be dangerous and even futile. In his response Jeffrey reiterated that he was asked during the interview among other things, about the general security aspects in Sabah, and the Kampung Tanduo intrusion last year. The article has gone viral since Sunday and has even been shared by the Sabah Sarawak Keluar Malaysia FaceBook Group run by UK-based Borneo rights activist Doris Jones. The online portal report, when last accessed, appeared to be carrying leading and loaded questions on the Sabah claim and apparently steering him in a certain direction.